As a part of a larger research inquiry conducted by the New Media & Digital Cultures graduate program at the University of Amsterdam, we are conducting a study of the English Defence League (EDL), one of the largest populist street movements within a generation (Bartlett & Littler) and more specifically, how their networks are organized in the digital space. Through their organizational efforts EDL has provoked discussions of cultural fragmentation within the UK stemming from anti-Islam sentiments and racially motivated rallies. The group’s prominence has experienced a number of ups and downs over the past two years and appears to display a slow decline in relevance (HOPE not Hate, Counter-Jihad). Despite this the group continues to demonstrate a willingness to provoke discussion through the Internet as well as in physical public spaces (Bartlett & Littler; HOPE not Hate, Counter- Jihad). EDL and its members can be loosely identified by their activity on social networking sites such as Facebook and Twitter but further information about their involvements in the group are not entirely known. Through the efforts of Nick Lowles and the HOPE not Hate Campaign based in London, a general picture has been painted of the EDL. The groups engagement in public demonstrations and more recently politically motivated events have helped with this understanding yet the condition of the organization through its online activity is less clear. As the actual number of members are unknown we will focus on the many supporters of EDL that have flocked to social networking sites such as Facebook and Twitter. Our aim will be to aide in general analysis of the groups activity specifically through Twitter feeds and user pages. An inquiry into whether or not there is a significant cohesion or fragmentation within the group will help us understand whether there is a decline or rise in the active use of members online. Are users passively retweeting information on their Twitter feeds and thus participating in a sort of ‘slacktivist’ participation? Or conversely, do they display a structured and dynamic method of sharing information across their pages? We will refer to Twitter pages and identify the members’ level of engagement with content. Especially looking at the types of content whether they are news stories, videos, blogs, etcetera and where they are linking from. By delineating those who are more active on Twitter ie those with more followers, retweets and significance of posts, we can understand those who have a greater influence within the group and those who are passive supporters. Using what information can be found on the Internet and through the groups Twitter page research with insightful information on the present condition and motivations of its members and the general state of the EDL. Peter Knoope, the Director of Counter-Terrorism in the Hague has outlined a singular theory to combat social entities such as the English defence League that operate in reaction to societal changes. In Knoope’s view, members of the EDL perceive themselves to be excluded and pushed to the periphery of society due to a number of reasons such as lack of education, lack of healthcare and a perceived erosion of British culture in the face of shifting populations (Bartlett & Littler). As a response to these perceived ‘attacks’ they retaliate towards those who warrant these changes. As a direct response to this, Knoope cites that the inclusion of groups such as the English Defence League into political dialogue is the primary solution to not only understand them but to ease any radical tensions that may arise if left disregarded and unnoticed. This research is not about how the English Defence League uses the Internet. Rather, it is about how the EDL network is connected and what roles they assume as well as the depth of their contribution to the community. This research will hopefully provide relevant knowledge for organizations like HOPE not Hate Campaign and others to counter counter-jihadism in Britain as well as across the world. 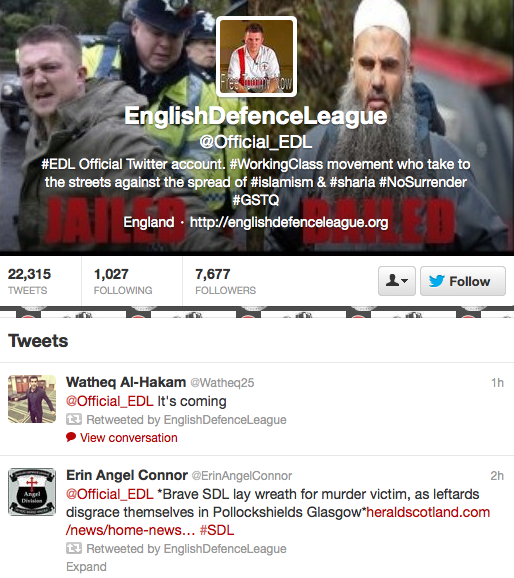 How cohesive or fragmented is the English Defence League if we look closely at user and group engagement on Twitter? * What is the role of leaders, operators and supporters in terms of hierarchy? * How does their status within this online community offer us an overview of their structure and organizational framework? * Is the content the Twitter users share influenced by their online role within the community? This investigation focused on a selection of 40 members found on Twitter and evaluated their individual relations to one another. Hereby we took into account the power diagram as proposed by Peter Knoope, Director of the International Centre for Counter-Terrorism in the Hague. Knoope describes an organisational pyramid beginning with a base of ‘Supporters’ whose role is the mutual identification with the ideals of the group, usually participating in a passive role online and sometimes appearing for public demonstrations. The middle portion of the pyramid are ‘Operational’ members defined as those who activate the Supporter base through social networks and sway a considerable measure of influence. Those at the top of the pyramid are those of the ‘Leaders’ already identified by the HOPE not Hate Campaign in London as Tommy Robinson aka Steven Yaxley Lennon and his cousin Kevin Carroll. Both have been recently imprisoned for separate charges which has left a considerable gap within the leadership of the group. With the custom-built tool CoWord, we used the dataset “jihad” to search on the keyword [EDL]. With this information we could generate a network analysis based on interaction between users. In order to produce a network analysis and illustrate how the group interacts and thus engages with one another, this study made use of the data-visualization tool Gephi. This is an open sourced program that creates interactive data-visualizations for all types of networks. This enables us to unearth and simplify complex systems by mapping hierarchies and as a result analyze engagement between users connected to the English Defence League. Furthermore, Gephi was also applied to illustrate the complexity of EDL’s networked structure, and thirdly to provide clues on the formation of hubs within the group. In so doing, we produced directed graphs and computed the degree of connectedness between the various players linked to the EDL (Wiki; 2012) In that process we took a number of statistics and metrics in special regard to generate a social network analysis. We measured the degree of inbetweenness, thus identifying influential actors. According to Monge et al. betweeness centrality is “the extent to which an actor mediates, or falls between any two actors on the shortest path between those actors” (Monge; 2009). Thus, nodes were ranged according to the degree of inbetweenness, meaning that we measured the node’s influence within the network based on how often the node appears on the shortest path in a variety of randomly selected nodes.# Other valuable statistics, generated in Gephi, included running and producing a 'network diameter' and a report regarding 'connected components'. Last but certainly not least, was to triangulate these measurements with the Pagerank algorithm. Through this algorithm we could measure the importance of each node in the graph. On a further note, through the Gephi dataset, we then produced a comparative list analysis. The first list included the top 50 Twitter-users integrating the keyword [EDL] in their Tweets. The second list was a comparative Klout-score of the same Top-50 Twitter-users. Klout is an online tool that measures online influence of users utilizing social media. It is also a valuable point of reference to understand how people influence each other on the web. Or as Klout adds “Klout collects public data in order to accurately measure influence. Users can control the data available to Klout by changing the privacy settings on their connected networks. Klout will never access your private data unless we have explicit permission” (http://klout.com/corp/faq ). The third list was based on the number of tweets related to the keyword [EDL]. Finally, for the fourth list, we triangulated all previous lists, with support of the Gephi visualizations, to double check our lists and enhance confidence to our findings. It must be noted that three users (shaunmoore3, richardfwheele1, fnyfer) had to be left out of the results. These users were suspended by Twitter so we were unable to analyse their data. Finally, we used a custom-built Twitter tool of the Digital Methods Initiative, to gather all the tweets for specific Twitter accounts between December 1 and December 31, 2012. The accounts we examined were Official_EDL, TheJayCalledLee, BBCDomC, JanOdden, pissedlizard. The abstracted files showed the most popular hashtags, URL’s and the most re-tweeted statuses. 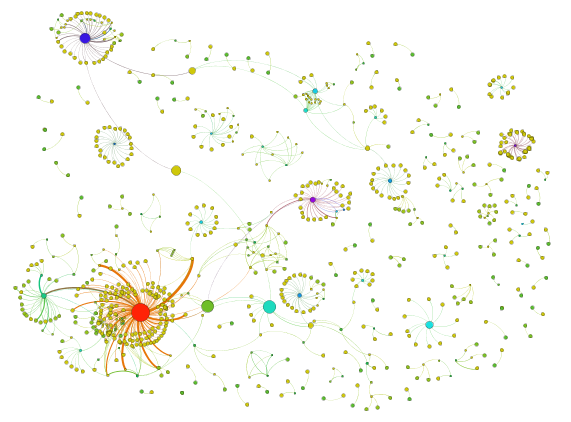 We also used the tool to triangulate the role of influential actors as illustrated in the Gephi graphs. In this section we will illustrate a number of results regarding the Gephi graphs and in addition graphs as processed in Excel. In so doing, these findings will be supported by data-visualizations created in Gephi. The Coword tool based on the dataset “Jihad” generated 1257 tweets related to the keyword [EDL] gathered between 28 November, 2012 and 14 January 2013. Within this data-set, 41.3% of the Tweets contained no links, whereas 58.7% of the tweets did contain links. First of all, figure 2 and 3 illustrate the directed graph based on the keyword [EDL] in the “Jihad” dataset. Our analysis of the Gephi graph, in figure 2 and 3, enabled us to produce another set of results. The graph shows a big cluster around Official_EDL, and a number of smaller hubs surrounded by a great amount of smaller nodes. The graph shows that there is only a small number of important hubs, managed by operators who connect a host of scattered Twitter users to each other. Also, the account Official_EDL is the biggest operator among them and contains the most connections. Although all of the hubs are connected, their connections do not represent direct connections and depend on a slight number of mediators to reach a wider audience. In addition to the operators or hubs we encounter a high number of small subgroups based on in-group activity. These hubs or subgroups consisted on average from 2 up to 7 persons. Of these subgroups we found regional groups, including groups of women and veterans. The network analysis indicates that centrality, the extent to which an actor is central within any given network, consists of 85 weakly connected components numbered, whereas the number of strongly connected components numbered 853. In this research the degree of inbetweenness was an average of 5.4, implying that the average amount of nodes interlinked by influential actors accounted for about 5.4 other nodes. The betweenness centrality also indicates that a great number of individuals do not really interact at large with other ‘hubs’. It is interesting to note that some of the larger subgroups are clustered around mainstream news sources like the BBC, ABC7 and Huffington Post. Data from Gephi as well as from the new custom-built Twitter tool showed a high prevalence of traditional media in the shared content between the users. 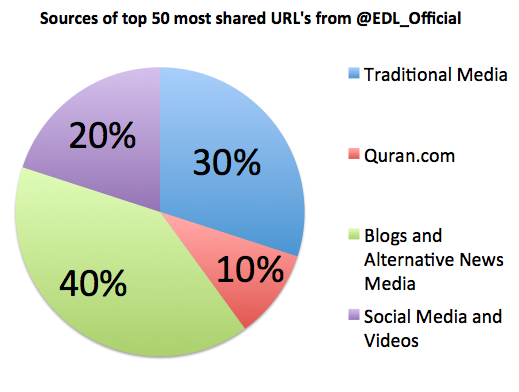 Through our analysis of the top 50 most shared links of the Official_EDL account, between December 1 and December 31, 2012, showed that the account uses a variety of sources to support their own cause varying from traditional media, alternative news sites, blogs, social networking sites, video hosting sites and a link to quran.com. Also, measuring levels of engagements led to the following results. In terms of identifying a leader, Official_EDL has the highest degree of centrality within the entire network. This is followed up by a smaller group of operators who then manage the supporters’ base. As illustrated in the table, most operators were either male, a media source such as the Times of Israel and only two remain unknown in terms of gender or activity. Finally, the supporter base consists of a great number of individuals or Twitterati who are connected to the operators. Overall the findings have shown a number of significant aspects. First of all, the data-visualisations show an online community that is loosely connected by a small group of operators in control of pushing content in and out. 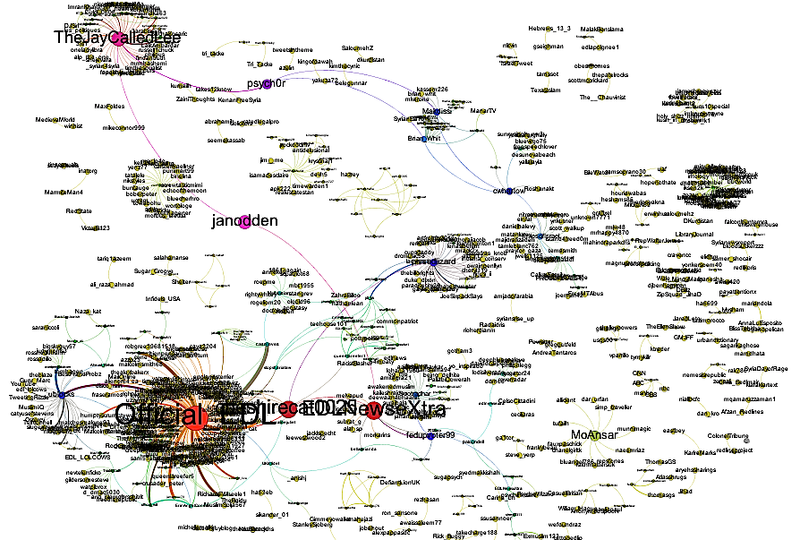 Looking at our results from Gephi and related inquiries we can conclude that Peter Knoope’s pyramid does not apply to the Twitter community of the EDL. First of all the leaders, as identified by HOPE not Hate, are not very visible on Twitter (Lowles; 2013). Kevin Carroll has no account and Tommy Robinson is not allowed to tweet as he is currently in jail for inciting hate crimes via his Facebook page (BBC; 2013). Furthermore Robinson’s account is sporadically managed by an unknown person (Twitter, @EDLTrobinson; www.englishdefenceleague.org, Tommy on Remand). 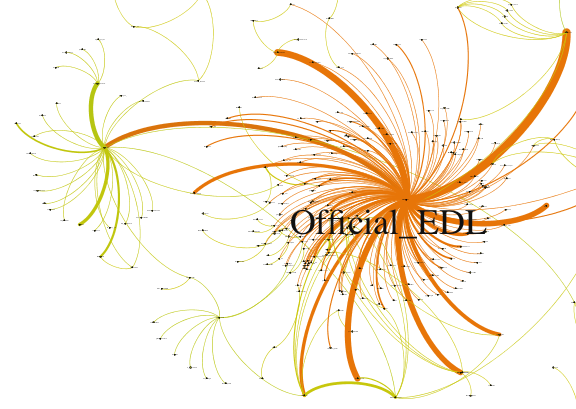 Based on the results we can conclude that it is quite clear that Official_EDL is the leader of the network. As seen in the Gephi-graph, engagement occurs on a number of various levels and occurs in a different hierarchy. More importantly, however, is the crucial presence and activity of so-called operators. We can subdivide two types of operators: those standing alone amongst their followers, and those linked to the official EDL Twitter account. The first group is often grouped around a medium or journalist. The second group of influential actors manage engagement between the supporters’ base as they disseminate information from Official_EDL to push it out to their supporters. In that organisational structure, supporters are characterized by their strong attachment to operators. And yet at the same time supporters demonstrate weak ties to the leader itself (Official_EDL). Hereby ‘supporters’ are those who receive and consume the information that ‘operators’ disseminate through their feeds. Typically a supporter does not re-tweet or share information of their own but instead remains within their own boundaries without actually engaging other users and content. In the online structure of the EDL the supporters are linked to either the leader, the operators or not linked to the important players at all. We can see small hubs of only 2-7 players that stay in the in-group without being linked to operators. Most supporters are typical in the way they do not re-tweet or share information. In the modern western world, developments like globalisation and individualisation form a constant threat to cohesion in society. In their need for grip, individuals and communities seem to feel the need to search for their own identity. The Internet plays an important role in this process. Through the Internet racial and extreme messages can have both an inspiring as a mobilising efficiency. It also serves as a source of information about the organisation itself (AIVD). Through Radicalization in the West: The Homegrown Threat, Arvin Bhatt and Mitchell D. Silber point at four stages of radicalization as they contextualize radicalization within the Islam. They enumerate four phases, arguing that at first “pre-radicalization” of the individual sets in.# The second phase is characterized as “self-identification” which refers to the moment in which individuals are influenced by internal and external factors.# This moment, described by Bhatt and Silber is a “cognitive opening or crisis, which shakes one’s certitude in previously held beliefs and opens an individual to be receptive to new worldviews” (Bhatt and Silber, 6).# This condition then leads to the third phase of “indoctrination” which is the process in which the individuals beliefs magnify with the interaction with other individuals and are facilitated by some form of leadership. Lastly, the fourth phase is “jihadization” a phase in which the individual is now fully devout to the beliefs that have cemented in their world-view and drives a militant mindset in which the individual becomes operational in his or her group. This theoretical framework can be turned a 180 degrees and be applied to a counter-jihadist group as the English Defence League. Applying these last four phases to the group leads to the following assumptions. This research indicates that a majority of the EDL community on Twitter is currently in the self-identification phase. By finding relevant communities and voices that reflect their own views they have either followed the EDL_official page or other sub-groups. Although there does exist a handful of users who can be seen as operators to which their roles assume the third phase of indoctrination. Their posts and views have usually been met with a permanent ban from Twitter or have been aggregates of information for a swath of supporters. A very small number of users can be placed in the jihadization category as there is little to no evidence showing physical results of activism. This research focused on Twitter only but it is not the only domain of the online sphere of the English Defence League. A comparable analysis of EDL’s Facebook account, websites and forums is required to get the bigger picture. This research was a first attempt to profile EDL’s online community. Since there is no traditional online structure and organisation it is recommanded to redo this research more often, to be able to conclude how the online network moves and who the important players are over a certain period of time. This could be useful to portray the online organisation as a whole. Algemene Inlichtingen- en Veiligheidsdienst. The Netherlands. Ministry of Internal Affairs. De gewelddadige jihad in Nederland: Actuele trends in de islamistisch-terroristische dreiging . The Hague: Buro van Bergenhenegouwen, 2006. Feddes, Allard R. “Studying the radicalization process in Social Media.” Digital Methods Data Sprint. University of Amsterdam. Amsterdam. 14 January 2013. HOPE not Hate. Counter-Jihad Report. (Chairman Nick Lowles). London: HOPE not Hate, 2012. Knoope, Peter. “The cause is not the cause.” Digital Methods Data Sprint. University of Amsterdam. Amsterdam, 14 January 2013. Monge, P.R. and N. S. Contractor. Theories of Communication Networks. Oxford University Press, US, 2003.